Welcome to SeaWatch, situated near Rosario Resort. Sunny southerly views looking up Cascade Bay. 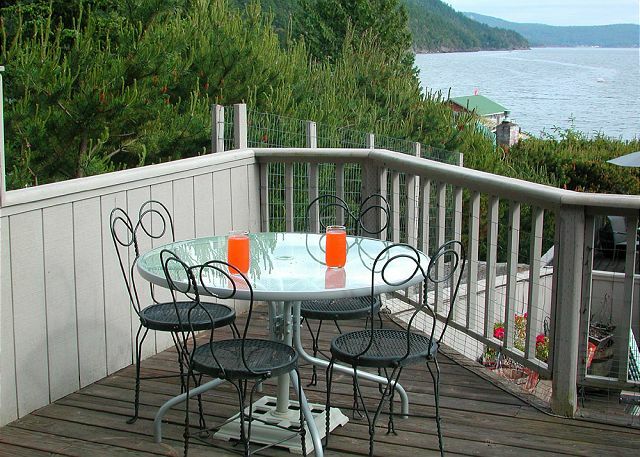 There are three decks at SeaWatch, all with amazing views of Cascade Bay and Rosario Resort's park like grounds. At the edge of the grassy front yard a wall of flowering rhododendrons greets spring visitors to this home. A view of the front yard with the home in the background. This home has lovely plantings of lavender, rhododendrons and shrubs for guests to enjoy while taking a stroll through the grounds. Beyond the gate is the deck of the detached guest house. Yet another deck to enjoy. The numerous decks are bathed in sun at noon, but cool and shady on a warm summer evening. A comfortable spot in the sun. A warm and welcoming classic great room greets you as you enter. The wood burning fireplace is perfect for cool evenings. The roomy kitchen is the center of the home and offers many amentities including extra pantry, cookbooks, and a breadmaker. The dining area comfortably seats six. The master bedroom is on the main level. 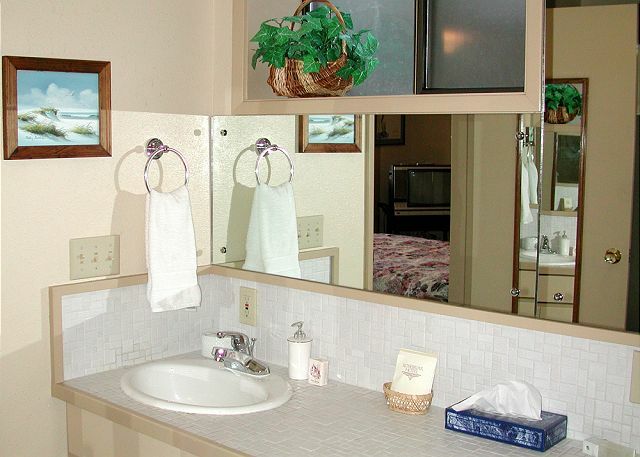 Master bath includes a large dressing area, spacious closets, double sink vanity, and large soaking tub. On the lower level of the home there is a second queen bedroom with ensuite bath. The bathroom of the lower level suite offers a shower. Cozy seating and fireplace in the guest house. 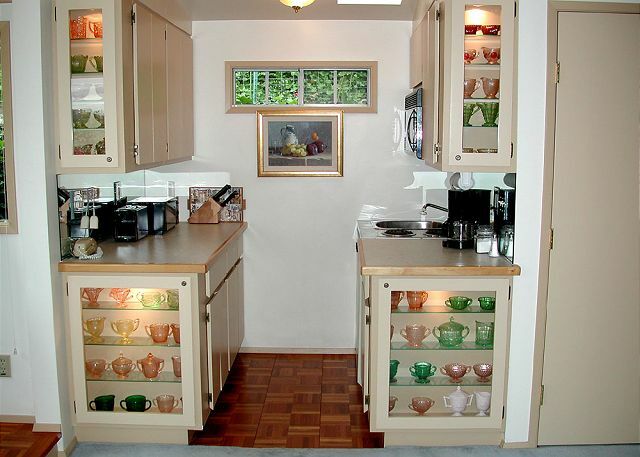 The guest house has a convenience kitchen with cabinets that display colorful glassware. Dining nook in the guest house. 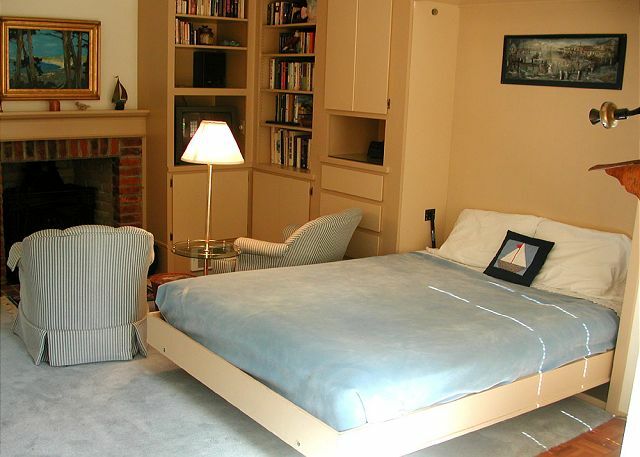 Guest house has a Murphy Bed. 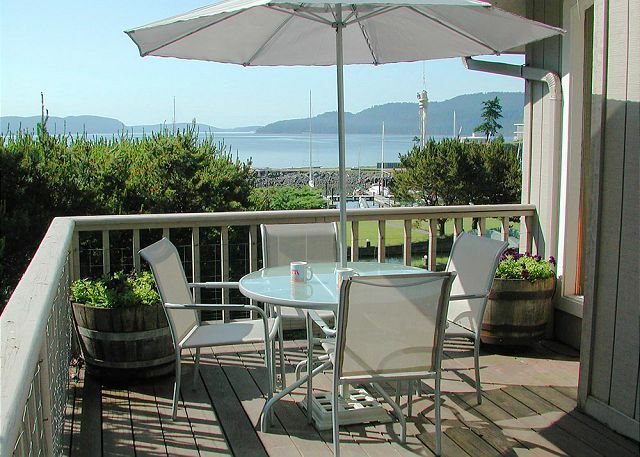 DOG FRIENDLY VACATION RENTAL HOME ON ORCAS ISLAND NEAR ROSARIO. 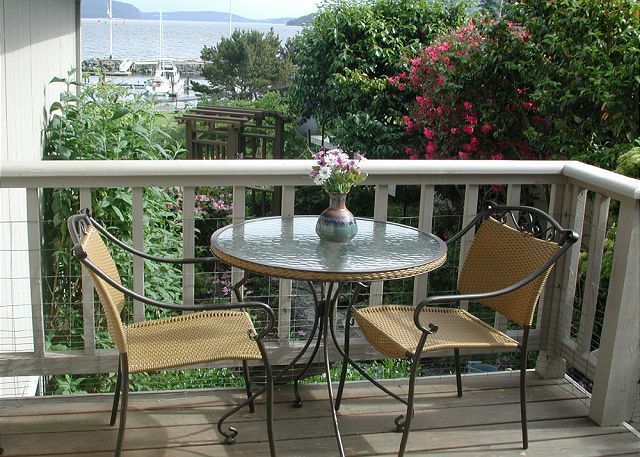 The Seawatch vacation rental on Orcas Island offers magnificent water views and the attraction of a superb location near Rosario Resort. 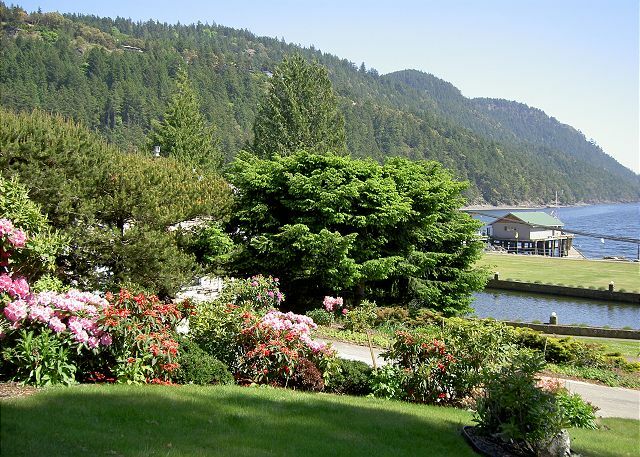 Their marina is just a short stroll from the home, so it's possible to leave the car behind and fly here by seaplane (Kenmore has scheduled flights) or arrive by private boat and dock in the harbor. Enjoy the proximity of a seasonal convenience market, Resort pool and spa, and restaurant and bar in the Mansion. Hikers will also enjoy exploring the lakes and hiking trails in nearby Moran State Park. 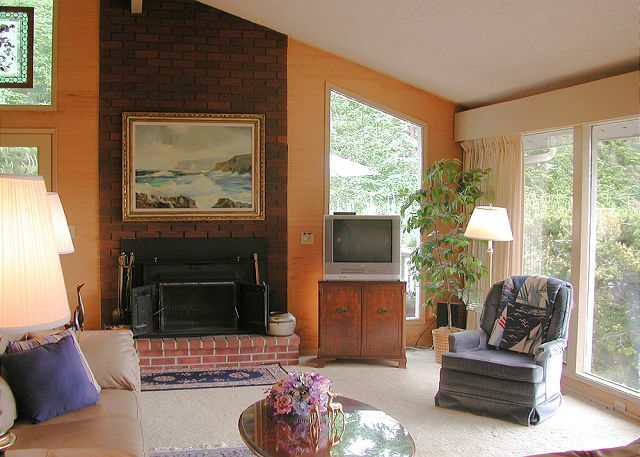 Skylights and picture windows welcome light into this comfortable NW contemporary vacation home. The great room beckons guests to gather for conversation and meal preparation. 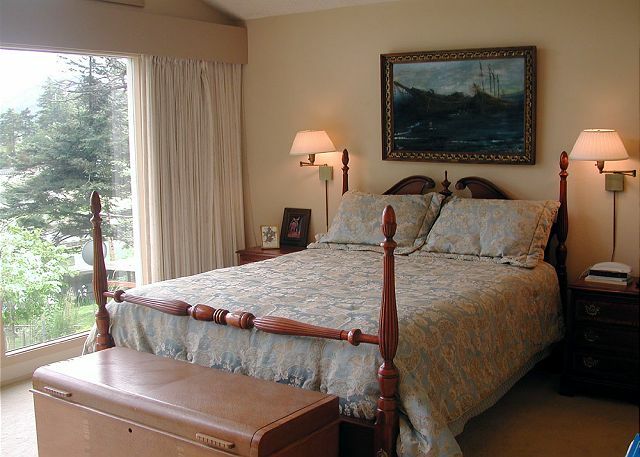 There are two master suites, each with queen size bed and nicely detailed baths- one is on the main level, one below. Two additional guests may be housed in the cozy detached guesthouse which features a convenience kitchen, fireplace,bathroom and queen murphy bed. Depending on the season, you'll find the attractive landscaping filled with rhododendrons, lavender, and other blooming shrubs. Summer guests will enjoy relaxing outdoors on the numerous decks, moving from one to another to catch the sun, curl up with a good book, take morning coffee, or enjoy an evening BBQ. Larger groups might also book Seawatch in conjuntion with nearby vacation rental homes Newhall House, #284, just next door, and the Residences at Rosario, #211. The house was spacious and great. What a beautiful view of the Salish sea from the house. There was plenty of space for everyone with the cottage in the back. Great place for a family. Highly reccomended! We stayed here for a family vacation. We took our boat and made moorage reservations at the marina. It worked out perfect, as the house is a short walk. The house style is older as other reviews have stated, but I liked it and it felt more homey / had a cabin feel. The kitchen had everything you'd need, lots of dishes and cookware. The guest house was super cute and also had everything you'd need. The deck was large and the bbq worked great for our salmon. This is a home that shows love and care from another time. The owners have done a nice job of having everything you need in the kitchen and the beds were comfortable. The living room is a very nice size and the view from inside the home is spectacular. I also loved the double refrigerator kitchen--so handy. The location is in the middle of all of the action at Rosario and it is conveniently located to an adorable yellow cottage that can be an extra couple of rooms for big groups. However, the overall maintenance of the place is lacking--ripped screen on the cabana door, bent screen door, carpet needs replacing, blinds need to be thoroughly cleaned (not the type of cleaning done on a weekly rental turn around). It also really needs to be sprayed for spiders :(. Am I happy I stayed there? Yup! It fit our needs quite nicely. I just kept having to turn off my fantasies of how I could fix it up and focus on our family gathering. Lori S from Beavercreek, OREGON does not recommend this vacation rental. My girlfriends and I rented this house as we could each have our own bed and bathrooms. The house is very large, yet kind of a weird layout. They advertised they provided some coffee filters but there were none in the main house. I found 2 in the place out back. Overall this place is nice but it is in need of some updating and a THOROUGH cleaning. Big view windows were filthy. I found long dark hairs around the bathroom sink and floor was dirty and dusty. Knives are not very sharp. Only scissors were lefty's and not sharp. Small flashlight in emergency drawer very dim - no extra batteries. Didn't know there wasn't cell service there. Landline doesn't seem to hold a charge very well. Appears to be mice in storage shed next to small house. We brought special DVD's to watch but the DVD player in the TV was broken. However, after notifying the rental agency they brought in another DVD player for us. If they would spruce things up a bit I would then recommend it to friends. You have a gem of a place. It really needs updating. The carpet was very dirty. Beds were VERY comfortable.Your management staff was Great!!! Family gathering great home for purpose. Was not happy that the management came by twice to ask about some broken bathroom towel holders from a previous guest. I did find the coffee pot carafe tip chipped and notified them. House needs to have updated TV's with DVD players. In the price of the rental the amenities of the pools to Rosario should be included. Or at least put the pricing in the vacation description. Wonderful open home with stunning views of docks, boats, ocean and islands in the distance from the living room and kitchen. Very comfortable furniture and beds. Amazing kitchen for cooking. 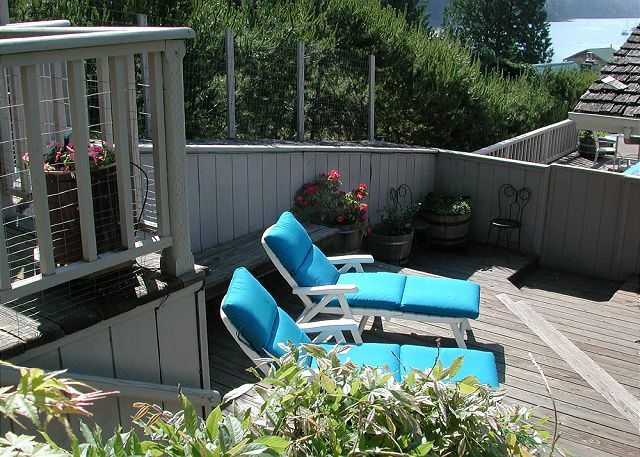 Cool back decks for entertaining. The cottage is really great! Loved our stay - hope to return! Had an amazing time at Seawatch!!! We went for a wedding vacation. There were 5 of us staying there and we had a great time! 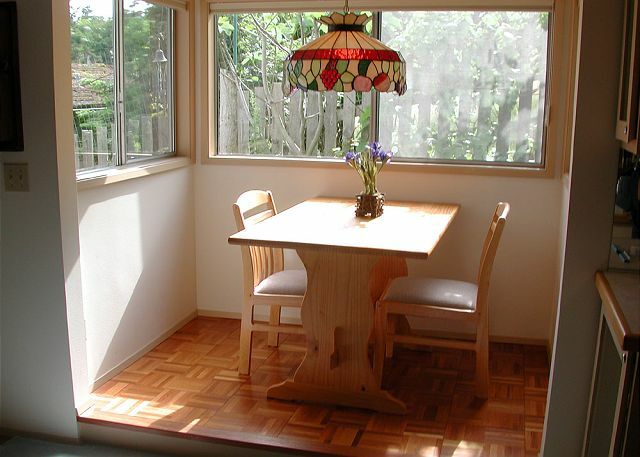 The house was spacious, lots of windows, and the back deck was a great summertime hang out spot. The house was dated but wasn't smelly or anything. We kept the windows open most of the time. The bar/restaurant within walking distance was wonderful and the views were amazing. We would definitely recommend the house to anyone for a stay! We were very happy with the house and especially the view. We were hosting our daughter's wedding weekend. A calming setting with a beautiful glimpse of God's creation! We had some flight problems so we did not get the full day upon arrival to enjoy our vacation home. It was a beautiful home..fantastic views and awesome location. We would stay here again. It worked out perfect for our family with 4 children. We only wish we had more time than two nights. The ONLY complaint would be that the house could use a little modernization. There was an odor in the kitchen which made us believe that the previous tenants had seafood and it lingered. We did not cook but the kitchen seemed well stocked. The family room furniture was comfy as was the bedding. I would recommend a change in carpet especially removing in the master bath. I have never been in a bathroom with carpet and though it was comfy I would tend to believe it would cause mold/mildew issues. Again...if we had a chance to visit again...we would stay here. Just a lovely location. The view of the marina and sound at Rosario Resort was incredible and kept youngsters and oldsters mesmerized by water born traffic. It was very quiet and heat/cooling was easily adjusted for comfort with natural air circulation. The outdoor patios with varied locations allowed family to be together or separate for quiet meditations. Water pressure for showers and bathing was good for all. The master bedroom with a wall of windows brought the outdoors in as well as viewing plantings and the sound. Extra comfort measures provided such as blankets, pillows, soaps, etc. I appreciated having a vacuum available as well for vital clean-up after family gatherings. It truly give you a sense of a functioning resort in a peaceful, spacious environment enjoyed by all. The family also enjoyed the 70's decor/architecture which lent a fun spirit, albeit a little worn! 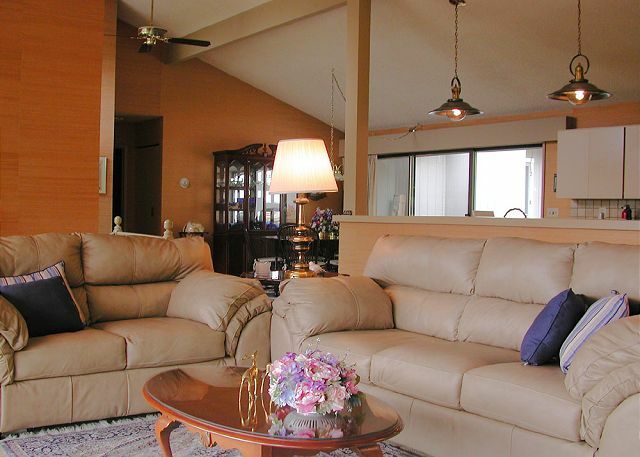 I would definitely recommend this comfortable home for an entertaining but relaxing stay. My family, including the dogs, had a great stay! 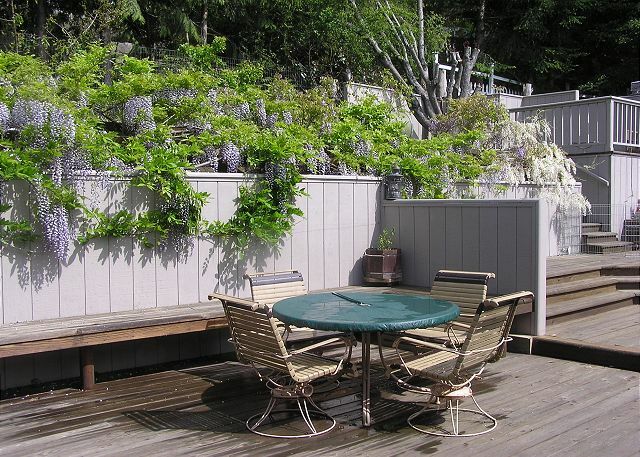 The house has a beautiful view and is perfectly located to enjoy the grounds at Rosario. The decks offered a great chance to get some sun and the amenities in the house were substantial. I would recommend this place to anyone looking to relax and have fun. We enjoyed very much our stay at this property during our Tom Kenyon workshop. The house was very clean and instructions were available to make our stay comfortable for us and for the owners. Property was very comfortable. Only problem I had with it is the complete disorganization of the kitchen and storage areas. It was difficult to find , looking for a meat thermater? You'll find 6 in 6 different drawers. Also, no empty cabinets for visitors food. a guest from Everett, WA does not recommend this vacation rental. We rented this property for a family stay during a wedding for one of my daughters. The location was perfect and the view from the home ideal. The rental process was flawless and the information provided by the management company detailed and complete. The home was generally clean although dated in decor and design. The carpeting did have staining and was in need of cleaning/replacing. Everything in the home functioned well and we had no complaints about any aspect of it. Nice home with great views, located away from noise and traffic. Interior pleasant and roomy. BBQ grill provided but need to be careful lightning it. One couple and two single women used the two bedroom house and separate little house. We had everything we could possibly have needed, were able to host a brunch for 16 easily and everyone had a great time. We had a great time in Rosario staying at The Sea Watch. The view from the living room never gets old. House is a bit dated but has everything you could need. The decks in the back are very nice and private. 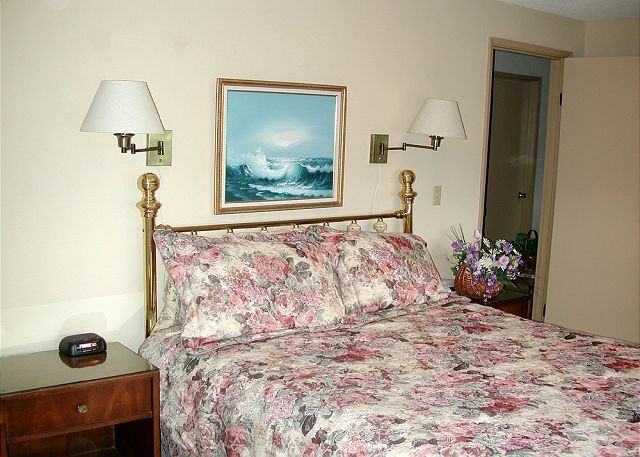 The location is great being that you can enjoy the resort facilities as well as the proximity to Moran Park. It was a great holiday. For an east coast person,the trip to the San Juan Islands was a big hit. the view from our living room was just spectacular. I don't know if it is the nicest view on the island but it must be in the top 10. Overall, we had a very nice vacation. San Juan Islands, especially Orcas Island, were beautiful. Very relaxing and quaint. Ferry experience one for the books as you could hop on any ferry within the island system once paying fare in anacortes. Rental home was well kept for an older home. Some repairs needed but accommodating. Wish the salmon fishing had been better. The location was perfect for the family of the bride! But there was too much décor and brick-a-brac around the house. Fewer decorating items would be more comfortable. But overall loved it. Rented this house to celebrate my son's graduation. The location was great, the view spectacular. Plenty of room in the house and out on the decks. My only complaint would be that the guest cottage smells musty. Will definitely rent it again!! Overall we were very pleased with our rental home on Orcas Island. The location and view were fanatastic. The rental home's kitchen was spacious and was very well equipped with utensils and appliances. 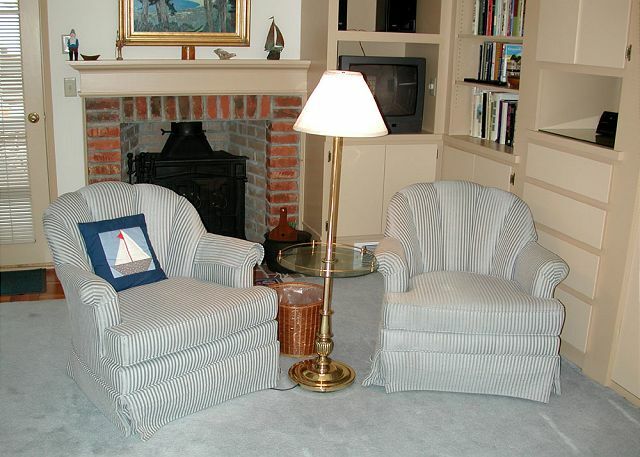 The home was very clean and the furniture was adequate to accomodate 6 people. The outside decks were spacious which allowed our 3 year old grandson to play in safety away from the street. If vacationers are traveling with small children there was a lack of one safety feature. The railing going down to the entry had wide spacing which would allow a toddler orcrawling baby to go through the railing and fall down to the entry landing. The only negative comment is that the adjacent small guest "cottage" had a broken toilet so we were unable to use that part of the rental home. We're very sorry that the toilet in the guest cottage malfunctioned during your stay. This has been repaired. We also understand about the railing spacing. The current building code requirement of a 4" spacing was not in effect when this home was built. Thanks for bringing this cautionary advice to the attention of future guests who may also have toddlers. After the land line telephone was connected, things went smoothly. The property is nicely situated. Location is great. It is a somewhat dated property. Some attention to detail such as extra linens are example of thoughtful improvements that could be made. We had a great time with two other couples also staying in the home with us. We moored our boat across the street at the Rosario Marina (less than 2 minute walk). They weather was great. 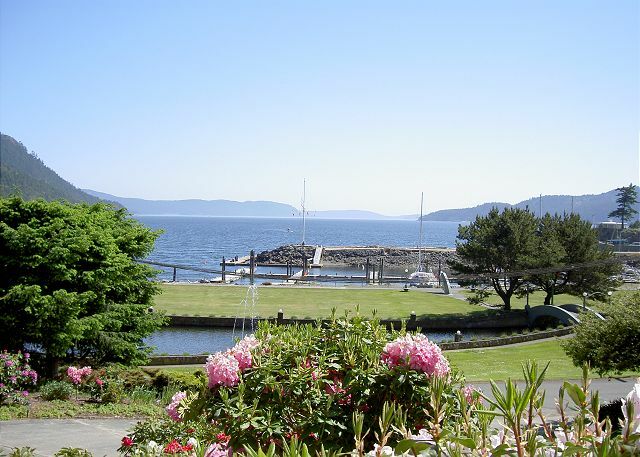 Nothing is too far away when you're on Orcas Island! We enjoyed our stay at SeaWatch very much. The view was amazing and it was very relaxing. There were a few things that we think should be addressed before we stay again (hopefully next year!) The downstairs bathroom shower head is the most painful thing ever invented. Its like having thousands of needles shot at you over and over again. I found myself hiding from the spray. The kitchen garbage had also been left from the previous renter and there were several dead and live bugs through out the house. Some other things that weren't really a problem but could add to the experience would be to find a way to warm up and dry out the downstairs bedroom. Its very cold and wet down there at night. Also some of the area rugs could be removed as they shifted and frequently trips us. Overall very impressed with this house! Wish we were still there! Everything was wonderful. Well equipped kitchen! The house has a beautiful view of the harbor and the park in front of it. The layout of the house is great, the kitchen is generously sized and has 2 refrigerators. There's plenty of decks on 3 sides of the house & the back area was fenced so our dogs were not able to wander off while we were outside. The surrounding neighborhood is a really nice area to take walks. We really enjoyed our stay.